...and nothing makes us happier than getting a chance to celebrate healthy choices, new habits, and fitness milestones. Today, we’re celebrating Jen’s decision to practice self-care by investing in her health and fitness. Let’s hear her story. After years of yo-yo dieting and bouncing from gym to gym, Jen started a membership with Fit Factory at the urging of a friend. Jen had signed up with several different gyms in the past, but nothing had ever “clicked.” She’d never found a community or program that helped her maintain a healthy weight, stay accountable, and exercise consistently. When she joined Fit Factory, she wasn’t sure that anything would be different, but she knew that she needed to put herself first and prioritize her health if she wanted to make any lasting changes. incorporate strength training into her exercise routine (she’d always been a “cardio bunny” and had never lifted weights before). Jen said that her biggest goal is to become the best version of herself...to become stronger and healthier every single day. And she knows that this will only happen if she kicks her excuses to the curb and continues to make her health a priority, no matter what. Since joining Fit Factory, Jen has made massive progress: she’s lost weight, maintained a consistent strength training routine, and reframed her eating habits. 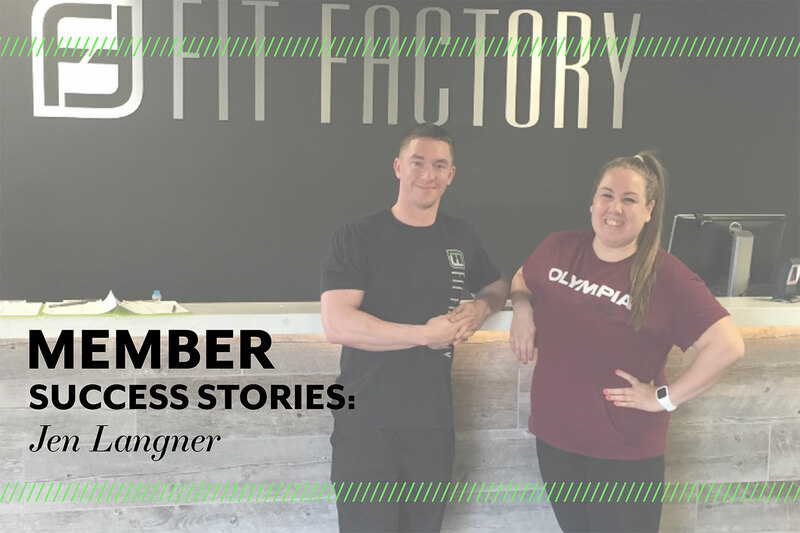 During her first month at Fit Factory, she worked out alone, but then she signed up for a personal training consultation and never looked back! Jen said that she “felt lost” when it came to strength training, and she knew she needed guidance to get the most out of each and every workout. Plus, her trainer holds her accountable, helps her plan solo workouts for days when she’s not training with him, and gives her personalized nutrition advice. Best of all, Jen said, “Because of my connections with the personal trainer team, I feel like I have even more people in my corner, cheering me on.” Finally, she's found a gym where she feels confident, comfortable, and connected. Thanks for sharing your story, Jen! We’re so thrilled for your success, and we’re glad you’re a part of the Fit Factory Family. Fit Factory personal training programs offer coaching to help you set and meet your fitness goals in order to live a healthier life and find a way to the fittest version of you. Visit our site to learn more about personal training in Braintree, Kingston, and Foxboro MA.